It is the end of the year, and for you salespeople, it’s the end of the quarter! For me this is definitely a rushrush time of year, and work is laying a heavy and stressful load on me at the moment. Thus I found myself going in to the office both days this past weekend. I happened to have my camera with me and snapped some images of the build in which I work. I have been interested in how the architecture and design of objects within one’s everyday world have their effects on us. 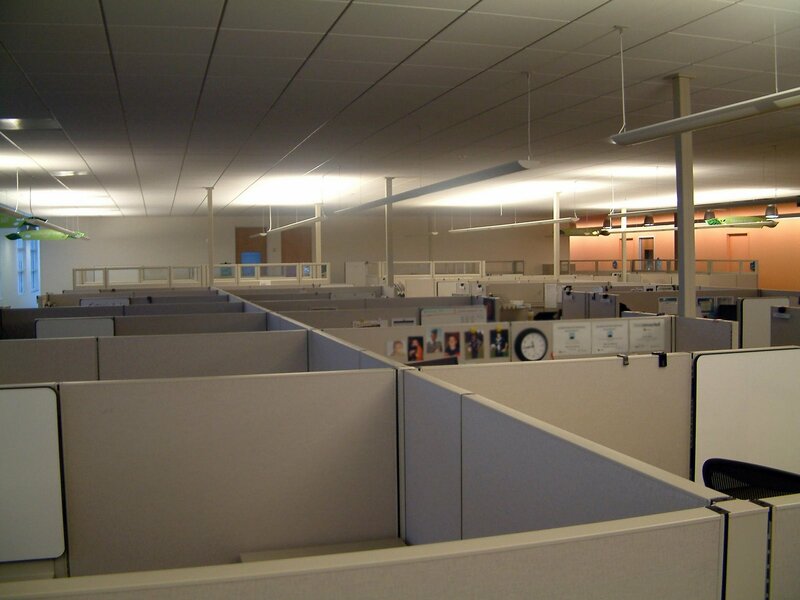 Being alone in the building heightened my sensitivities to the nature of the space. This building is an attempt to combine inexpensive concrete-tilt-up construction (think Costco buildings) with just enough outside-Silicon Valley hipness. The truth is, this building is really just a glorified call-center and order processing center, with some IT and a few other jobs thrown in. It is also a rather simple building in terms of design and layout. 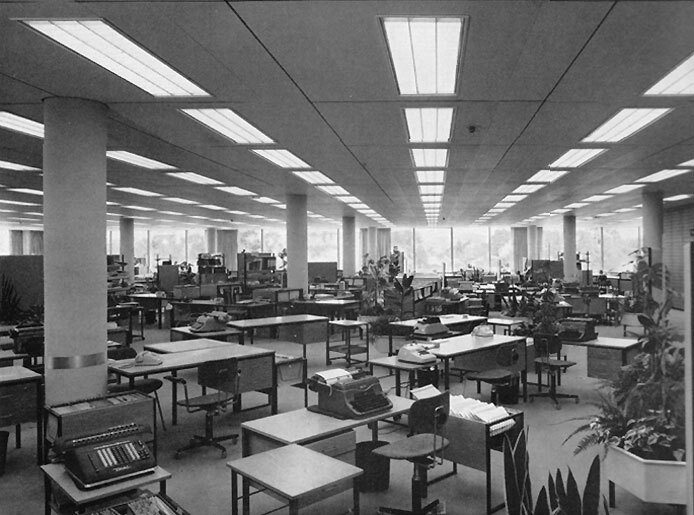 I have to say that there are some characteristics of the building and work area that I like, but I also have to say that it does not feed my soul, not that I expect it to. Like other aspects of my job, such as the good benefits and decent pay and good people to work with, this building is part of the “golden handcuffs” that make it difficult for me to dislike my job enough to leave and go pursue some personal “dream.” And of course I’m not bitter, it’s a lot better than some other places I’ve worked. It beats working on a green chain! If you’ve lived in the Northwest for very long you know what I mean. 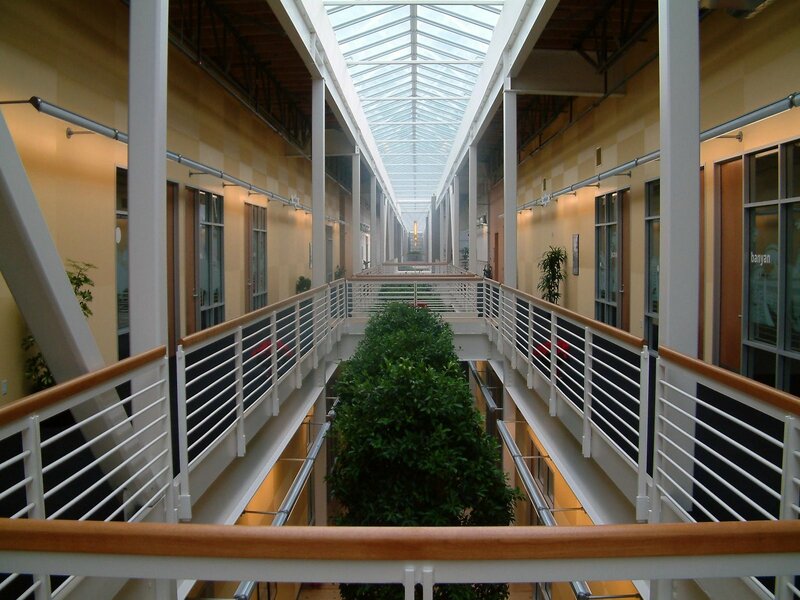 The long atrium that runs down the center of the building. I’ve been told it’s a quarter mile long. The little section of cubes where I work. 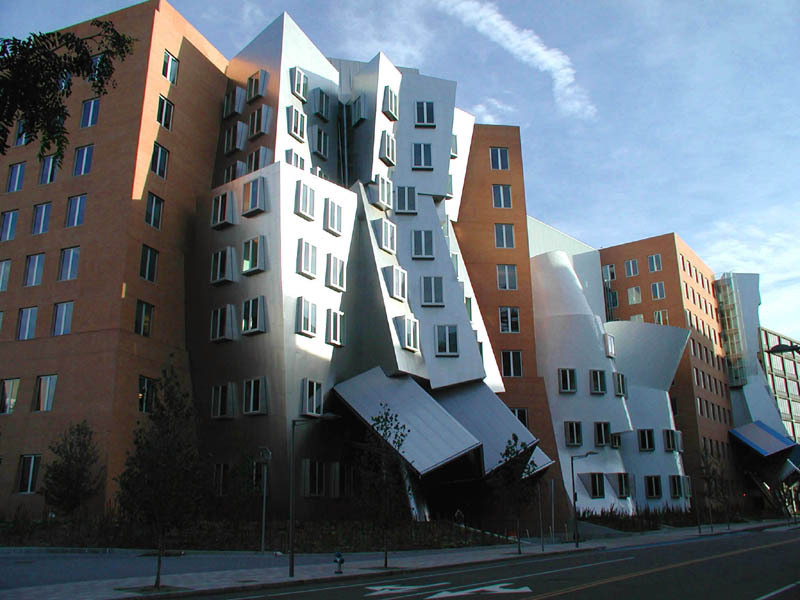 What I find most interesting about this building is that its antecedents go back to some of my favorite architects, le Cobusier and Gropius, and to their ideas of the relationship between form and function. In that sense this is both a modern, and in modern terms, now an old building. 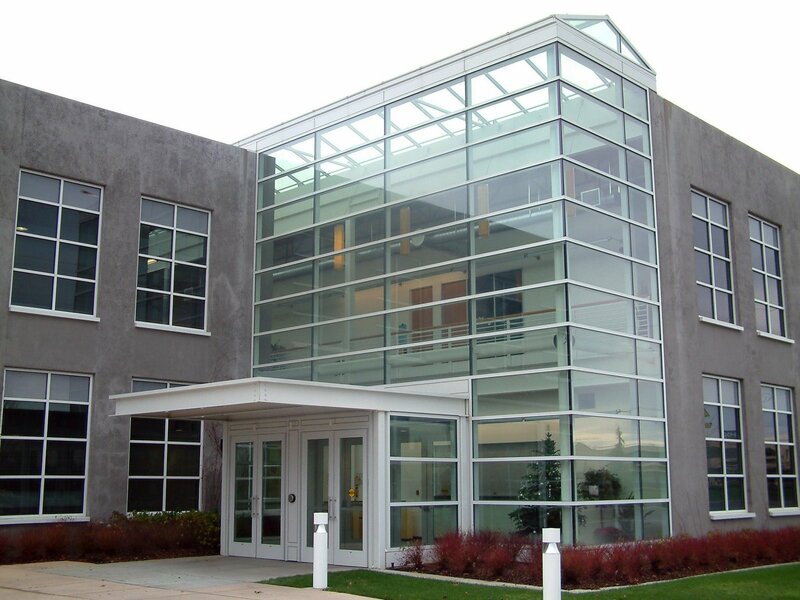 It is a very functional building and, in its best moments, its aesthetics are the result of great functional design. 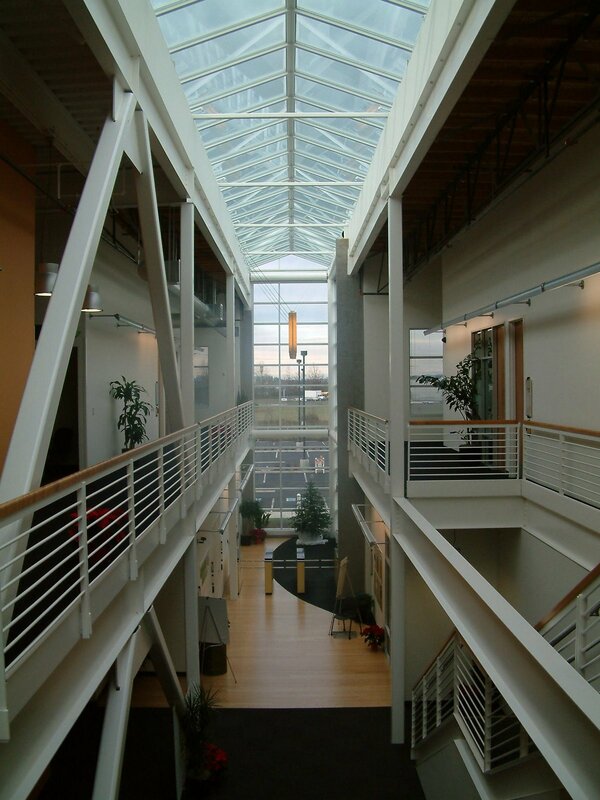 I am sometimes amazed at how many hours of my life have been spent in this building – since early 2002! >In an old farmer’s field some new development has been raising buildings along a route I often take from work when I want to drop off my dry cleaning. Years ago this part of town was in the country. 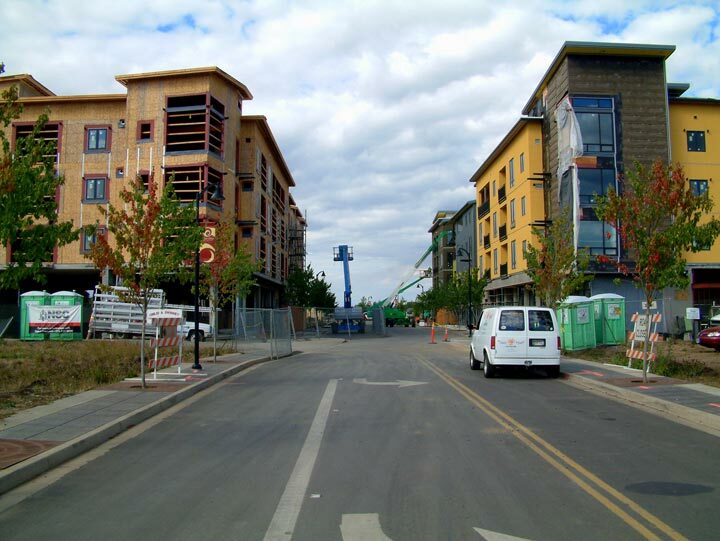 Now it is a growing area with a Costco nearby and new houses springing up. I find it amazing how building can completely transform a piece of land, and by how much I often like the transformation. 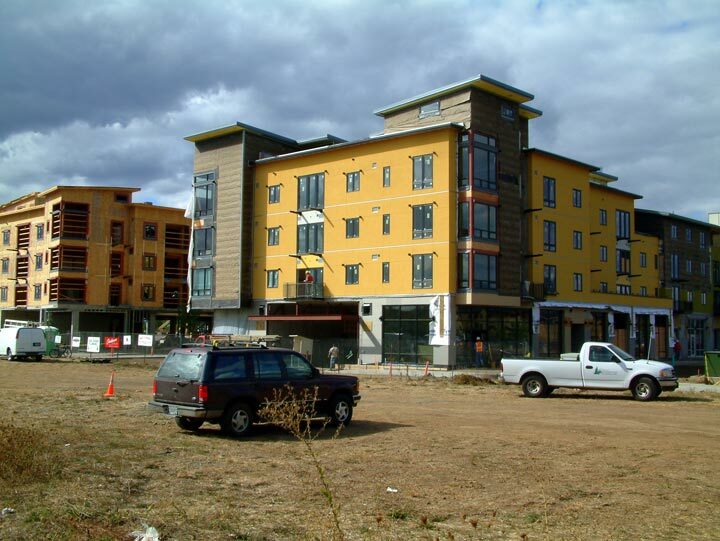 I am an advocate for more concentrated urban development and less sprawl, that is, development that brings together working and living spaces into near proximity while discouraging the growth of suburbia. But I also believe mere concentration is not enough. People need good design, which includes both well-thought functionality and beauty. So my eye has been caught by this new construction, which seems to border on sprawl, but is far more concentrated and aesthetically pleasing than most of its surroundings. I felt not a little conspicuous walking around the construction site snapping a few pictures, so I only took a handful and left quickly. But I think these will provide enough of an idea and to what is going on. On the one hand there is nothing very special about these buildings. Exciting and daring design doesn’t happen around these parts very often, and this is not particularly exciting and daring. But there is something about the design that has a post-modern-lite feeling, which is basically a simple modernism with post-modern trim (although I make no claims to really know what I am talking about). Regardless, this is a good thing. Most of the construction nearby is either concrete-tilt-up boxes (Costco, etc.) or 1960s suburbia houses. The buildings are also multi-use: stores below, offices and apartments above. Plus, by creating nearly identical structures on both sides of the street, they approximate a classic-style “strolling” street with a slight European flare. I wish the street was narrower. That would make it a little more human in scale, rather than scaled for autos. But if they did that it would be downright un-American. 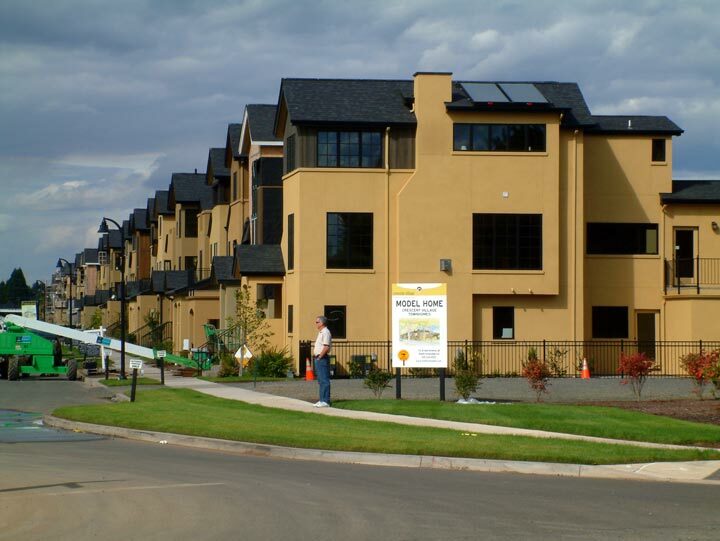 As part of the overall development, there is a row of new houses going up as well. If you want one, they start at $475k. Which means you won’t see me lining up just yet. My hope, as it is with all new construction around these parts, is that it elevate the prevailing assumptions about how people can live and work. We’ll see. My curiosity is piqued. Now they just have to make it more affordable. >Sunday, Labor Day weekend, was beautiful. The family went out for breakfast to one of our favorite haunts, and then we decided to take a walk around the University of Oregon campus which was next door. I had not been on campus for years. 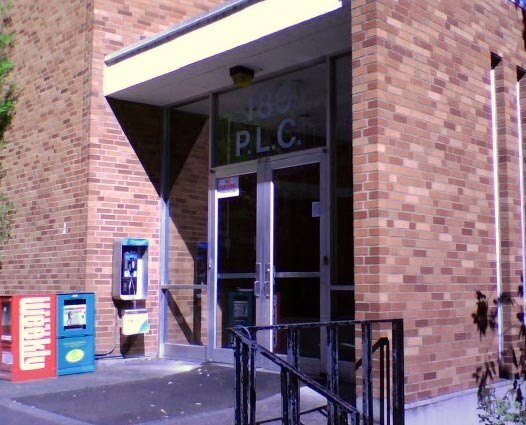 I graduated from the place in 1989 with bachelors degrees in film studies (the old Telecommunication and Film dept.) and in art history, then again in 1993 with an M.A. in film studies (emphasis on independent film aesthetics). I also used to take portrait photos there when I was a professional photographer. I have to say the campus was perfect for strolling and just enjoying the surroundings on this quiet weekend. But I also became a little contemplative. As we passed by so many of the buildings in which I spent so much time many years ago I couldn’t help but think about how important some doors can be in one’s life. These are some of those doors for me. 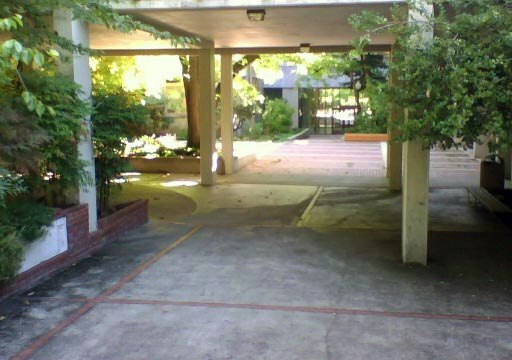 Many times did I walk through this entrance to the Art and Architecture building. Most of my art history bachelors degree came in one year as I crammed five courses a quarter of memorizing slides, dates, painters, architects, styles, and historical periods. I loved it. I have always loved art, but studying art history opened my eyes to how magnificent the breadth and depth of art has been. 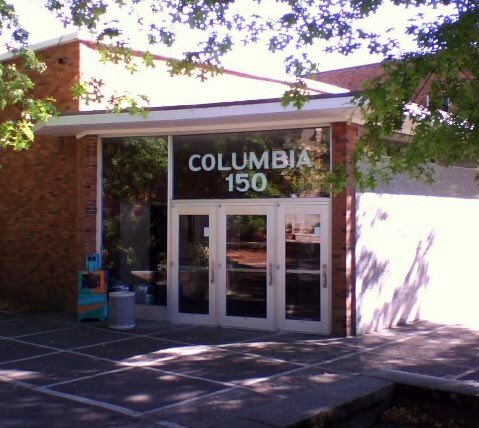 150 Columbia is a large lecture hall. Although I had some science courses there, this is also where many of the films shown by the student forum (or was it student union?) were exhibited. This is also were visiting filmmakers might show their wares. For example, I saw a two-night presentation of Stan Brakhage’s films with Brakhage introducing each film and talking about his life as a filmmaker. 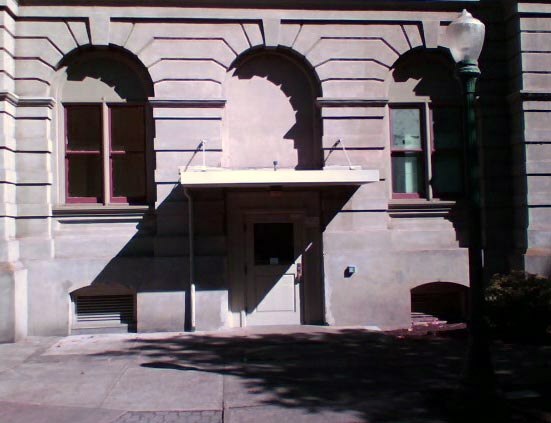 Villard Hall was where the old Telecommunication and Film department (now defunct) resided. I spent many hundreds of hours in this old building, and hundreds upon hundreds of times going through this side door. 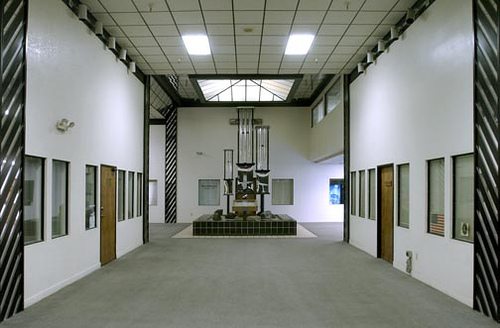 This is where I studied film history and aesthetics, created videos, and taught film courses as a GTF. I figured out how to “sneak” through this usually locked door late at night and on the weekends so I could spend extra hours editing my projects. Every Tuesday and Thursday evenings I spent a couple hours or so in this large lecture hall watching films for my film history courses. This is where I was introduced to the cinematic “cannon.” Here I saw Griffith, Renoir, Godard, Sembene, and so much more for the first time. Here is where my world opened up and I became a person of the world, with my mind expanded and heart grown bigger. Words cannot really describe how big of an impact this door has had on my life. So that was part of my Labor Day weekend. I’m sure in your life you have had, or still have, doors that are more than just doors. We live is an age of great abundance for many. And yet, so many struggle for basic things, like shelter. Many of us, though not particularly wealthy by Western/Northern standards (I live in the U.S.), still live like kings compared to much of the rest of the world. And yet, sometimes we still know (I still know), at times, the struggle just to get by, especially those of us who have tried to support a family on a meager paycheck. 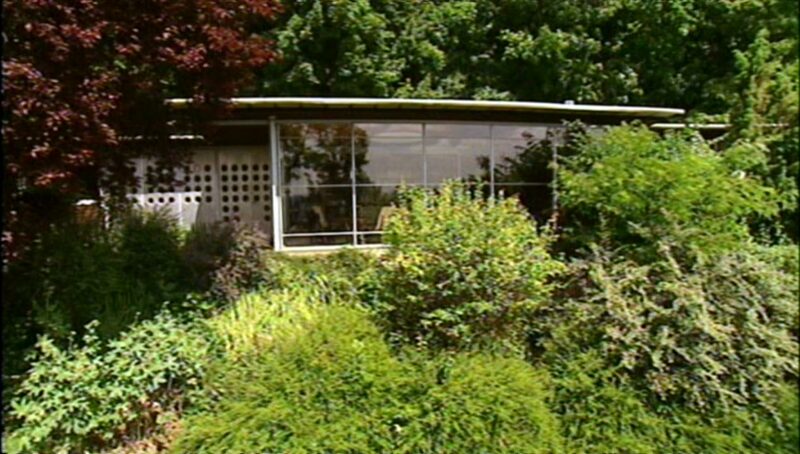 With those thoughts/experiences in mind (sometimes buried, sometimes glaring) I watched a fascinating documentary on La maison de Jean Prouvé (part of a great 4 DVD series called Architectures by ARTE France, distributed in the U.S. by Facets Video). I was struck by the simple story of a man who lost his business, faced into a difficult financial crisis, and had to then find appropriate shelter for his large family. His solution was to build on land others said could not be built on, use prefabricated pieces, ask his friends for help, and do it quick and cheep. 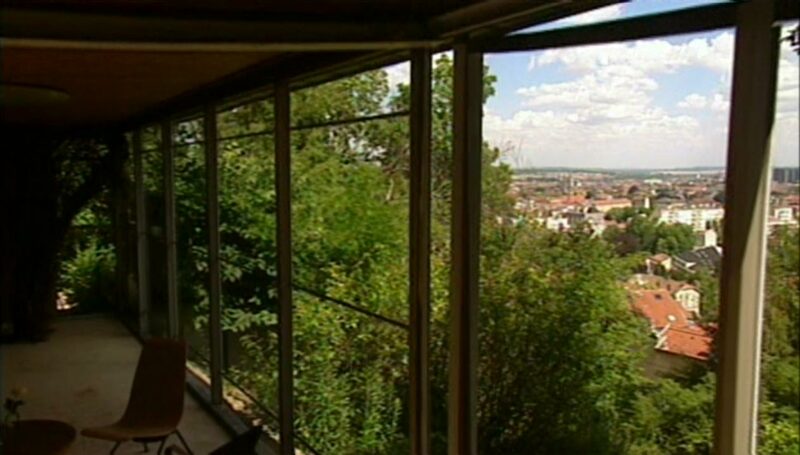 What Prouvé created became one of the most famous, yet modest dwellings of the 20th century. 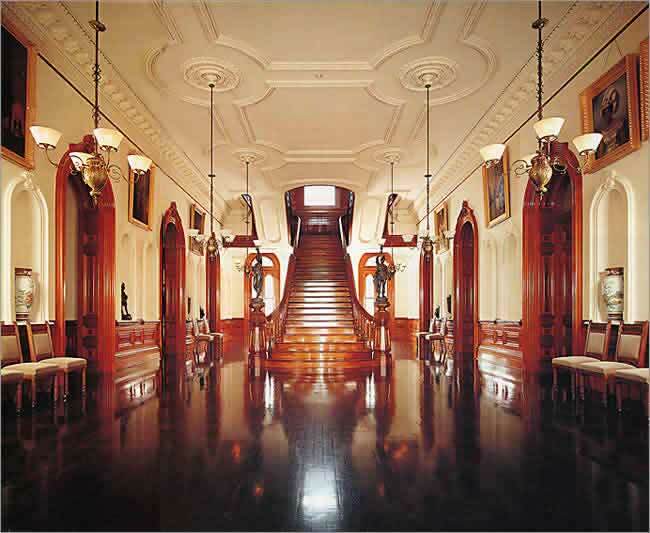 The house is also both a challenge and an inspiration to me and my aspirations for someday designing my own house. But it is more than merely a question of design. A few pictures will give some idea of the concept by way of the reality. As one can tell, the house is simple, though not exactly austere; the design is modern, though far from being overrun with ideology; and the space is very economical, giving what needs to be given without giving too much. It is truly an economy of means. What I also like was how communal and personal the building became, and how it became that way out of necessity. 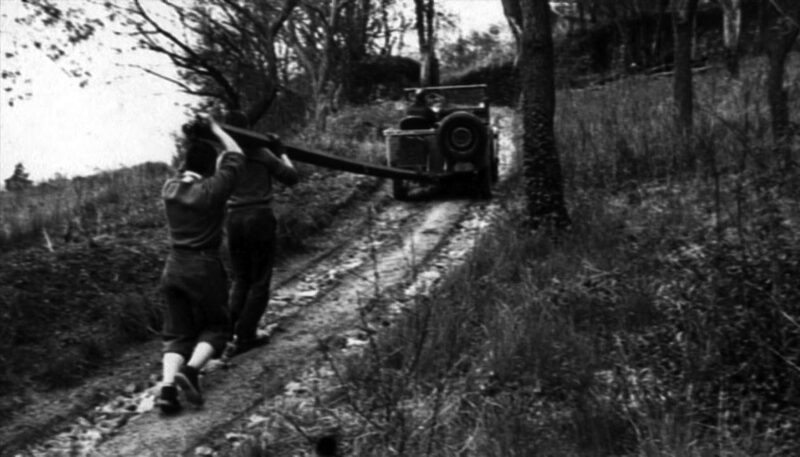 Photos show the Prouvés and their friends hauling materials up the steep hills, laying foundations, putting up walls, and helping the Prouvés reach their goals. My own philosophy, though still rather unformed, ranges toward the modern and the simple. I love quality and innovation. I also love the challenge, but so too do I love the finished product that can then be enjoyed. Although there are many aspects of Prouvé’s house I would do different, I often think about how much I have and want in contrast to what I actually need. I believe design and art are central to the human spirit. I am only willing to give up beauty when it is absolutely necessary, and only for temporary periods, for beauty is like air. Some will not find Prouvé’s house to be a work of beauty. To each her/his own. For my part I find tremendous beauty in the simplicity and design of this house, but I also see an acceptance of one’s place in the world. 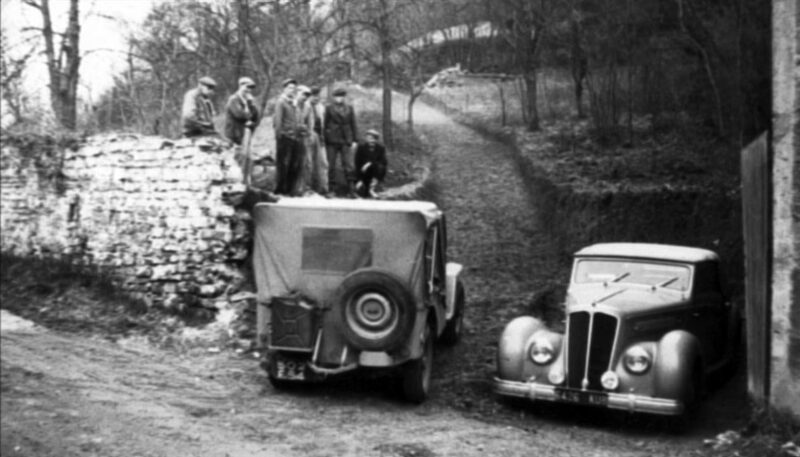 Prouvé was able to achieve both. Live within your means, that is a kind of beauty too. 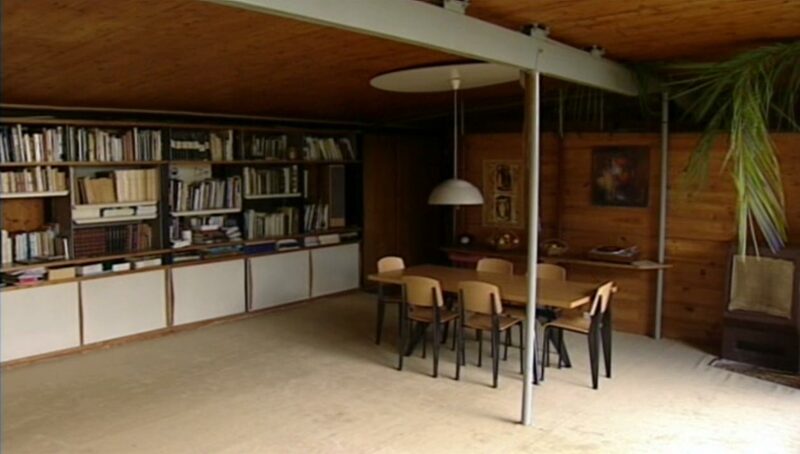 Jean Prouvé built his house in 1953. I find it an interesting coincidence that I began recently watching Eric Rohmer’s Six Moral Tales. Rohmer began directing the loosely connect series in 1962. 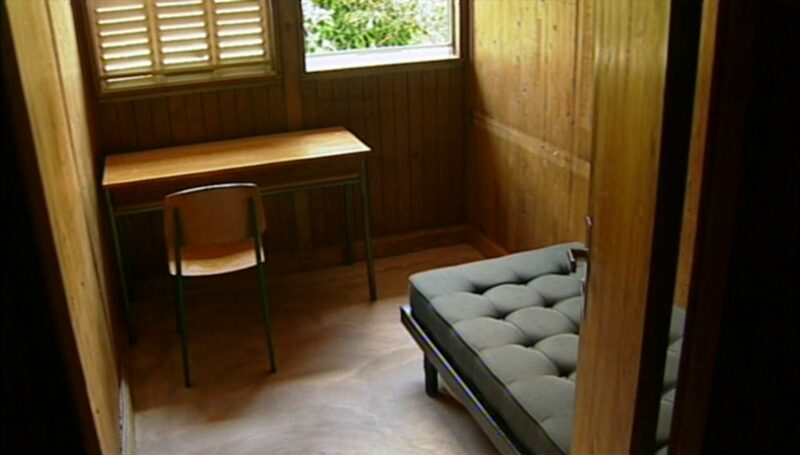 I won’t attempt an overview of Rohmer’s life or a critique of his films, but I will say that I find his circumstances of production to be equally as fascinating at those of Jean Prouvé. In the beginning Rohmer had no money to make films. He had written one novel and then some stories. He was unhappy with how the stories turned out and he felt he needed to make them into films to adequately get across his ideas. Eventually he got what he needed, but only just. His films, especially the early ones, are excellent examples of an economy of means. He shot on a shoestring budget, often using small crews and working with friends. He also tended to shoot in limited takes and tended to prefer first takes. He rehearsed his actors relentlessly and then tried to not let them ask for more takes. Sometimes he used improvisation during rehearsals, but rarely in production. His first feature-length film, La Collectionneus (1967), was shot at less than a 2:1 ratio, which means that most of the takes were at most done twice, and many only once. 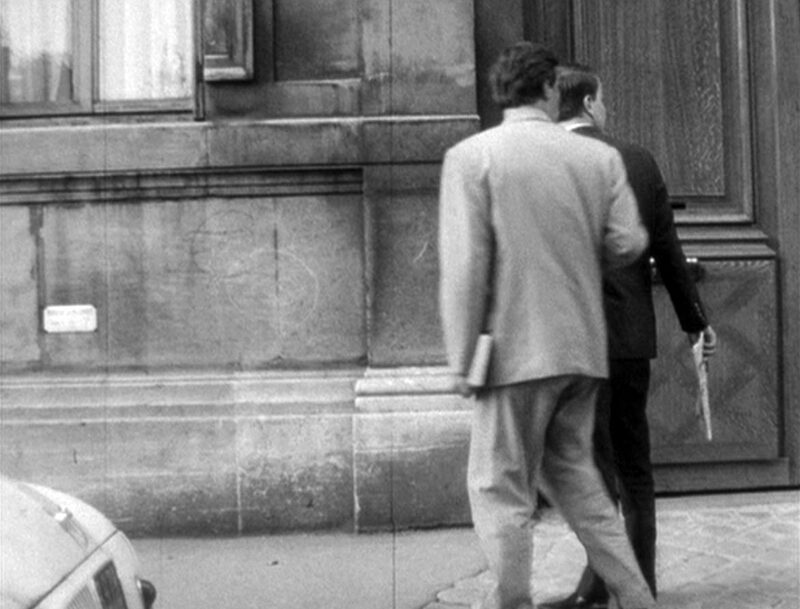 Rohmer’s first of his moral tales, La Boulangère de Monceau (1963), was shot MOS (silent), dubbing the audio in later and relying mostly on voice-over, on 16mm format, using found locations. Never released in theaters, this 20 minutes film was almost more of an experiment in style and production, but it clear set the tone for the later films. Here is a brief look at the filming/story telling style of Rhomer. While we hear a voice-over we watch a simple moment based mostly on looks and glances that are fuller of meaning than the rather unemotional surface gloss might suggest. When I compare Rohmer and Prouvé I see two driven men, singular in their ideas and ideals, producing great artifacts within strenuous limitations. I also see a mode of production, whether by choice or by acceptance, that is truly independent from larger financial/corporate interests. No one is completely independent, but smaller scales of production, working with friends and colleagues, forced to stay focused on the end goal, and beholden more to one’s own vision than to those of others, makes Rohmer’s moral tales and Prouvé’s family dwelling about as independent as one could hope for. 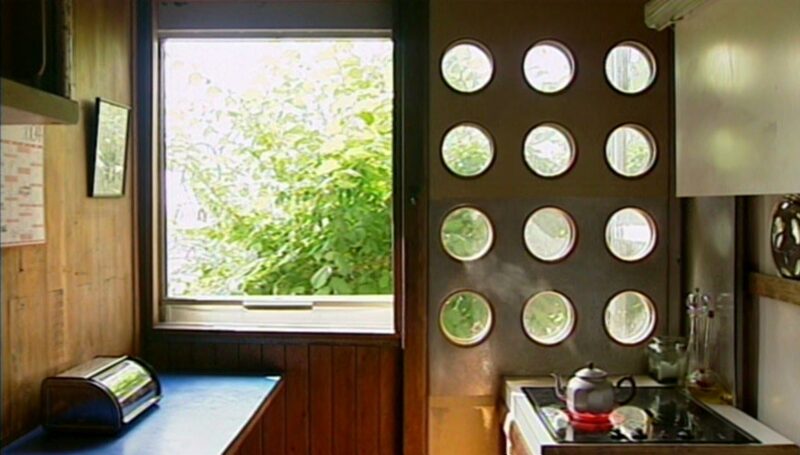 Some might say that Prouvé’s home is too simple and lacks too much. Some might say that watching Rohmer’s films is like watching paint dry. I know it is a matter of taste, but sometimes I would like to believe that not all taste is equal. Certainly, I find the final products of these two men more satisfying than so much else in this world. And that is what I look for in my own “limited means” life. The recent deaths of Michelangelo Antonioni and Ingmar Bergman, on the same day no less, highlighted two realizations for me: 1) I am, in many ways, a “high modernist” in my aesthetic tastes and passions, and 2) the prevalent and particular questioning of the concepts of truth and hope found in high modernism seems to have disappeared as a noble pursuit. In other words, I long for the days (which were before my time) when artists and filmmakers saw the modern, industrialized, nuclear world as harsh and bleak, but believed that art could truly change that world for the better – even if only by asking the tough questions. (Of course we all imagine the past as we wish.) Today, artmaking is too often viewed cynically, that is, there is no point in tackling the grander themes, rather art is merely about what is only personal and private, and therefore essentially non-transferable, and therefore merely kitsch. That filmmaking can no longer change the world seems to be the prevailing perspective. There was a kind of hopelessness in both Bergman and Antonioni, but there was also a sense that at least art and human creativity meant something, and therefore it was worth giving it a try anyway. It was also true that each of them, in their own ways, saw that the big questions of life – is there a god? what does it mean to be human? is there a viable salvation for humankind? etc. – were worth asking and pondering and turning inside out. I believe those are still live questions. I am inclined to think, however, that for the most part, filmmakers (except maybe some at the fringes) today do not see those questions as worth being asked. He was a visionary whose portrayal of the failure of Eros in a hypereroticized climate addressed the modern world and its discontents in a new, intensely poetic cinematic language. Here was depicted for the first time on screen a world in which attention deficit disorder, and the uneasy sense of impermanence that goes with it, were already epidemic. This condition has not left us. In many ways we are still profoundly alienated from this world and from each other. The alienation may even be greater now than when Antonioni first portrayed it on screen. And although he did not give us an outright solution, the response should not be to throw up one’s hands, exclaim life is just absurd and devoid of answers, and then fall into hedonism, consumerism, narcissism, or suburban apathy. 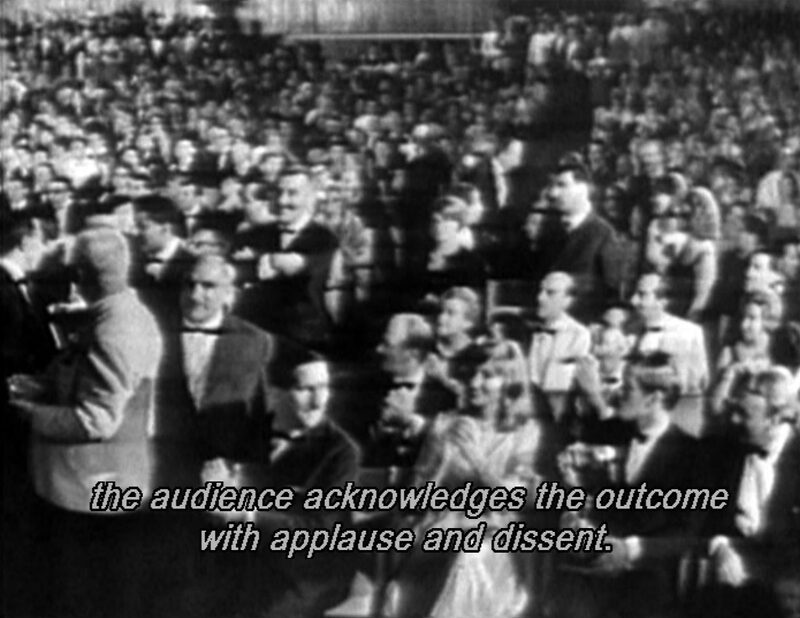 When Anotnioni won the Golden Lion award at the 1964 Venice Film Festival for The Red Desert (1964), the crowd had mixed feelings. 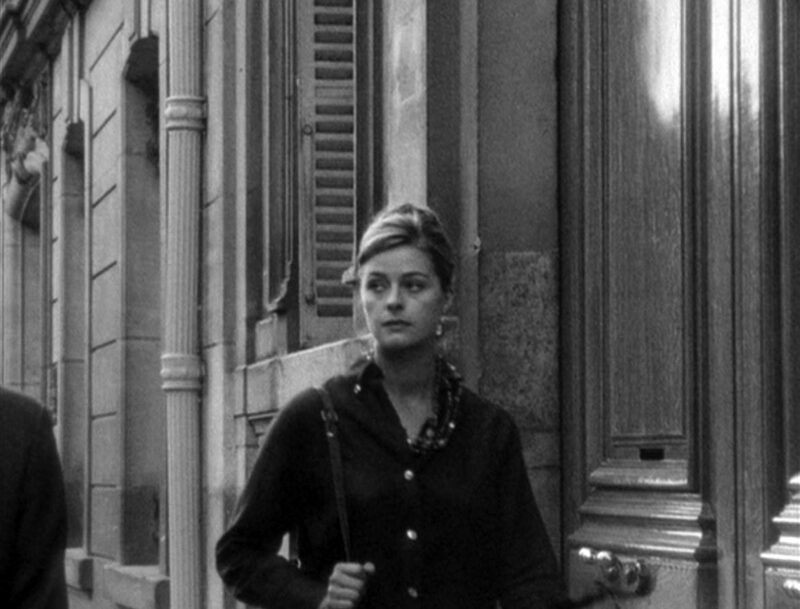 What is great about such contrasting responses is that it signals that people cared about the outcome, that what Antonioni was creating had meaning, that he was saying things that required a response – love them or hate them. Four years earlier he was also booed at Cannes for L’Avventura. But that was then. 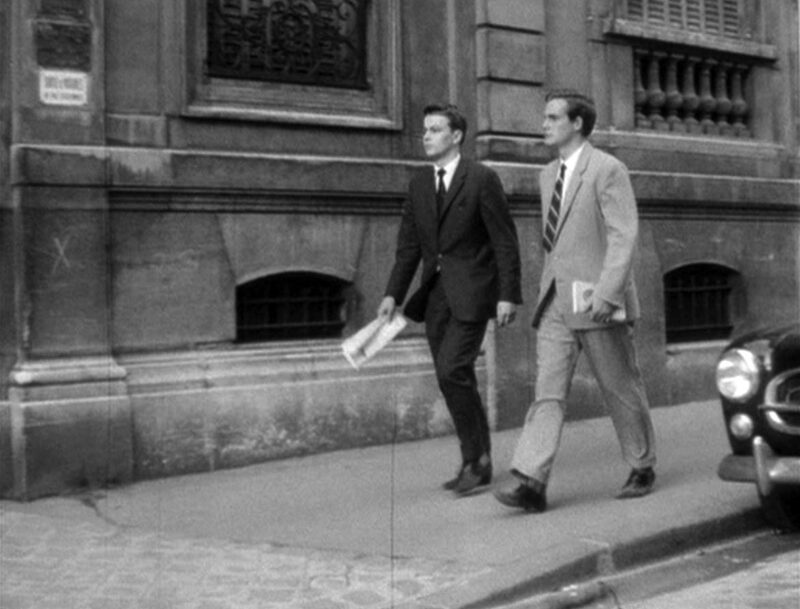 This was a time when intellectual activity about the zeitgeist could be debated, if not always welcomed, with Godard and Antonioni the two most commanding figureheads. L’eclisse (1962) appeared the year after Chronicle of a Summer, Last Year in Marienbad, and Paris Belongs to Us, the same year as The Exterminating Angel and Vivre sa vie, and the year before Contempt and Muriel—a period, in short, when large statements and narrative innovations often came together. That is my understanding (of course not my experience) of the late Fifties and Sixties. The zeitgeist was critical. Mankind was in a giant philosophical flux, and big issues, existential issues were on the table and debated. 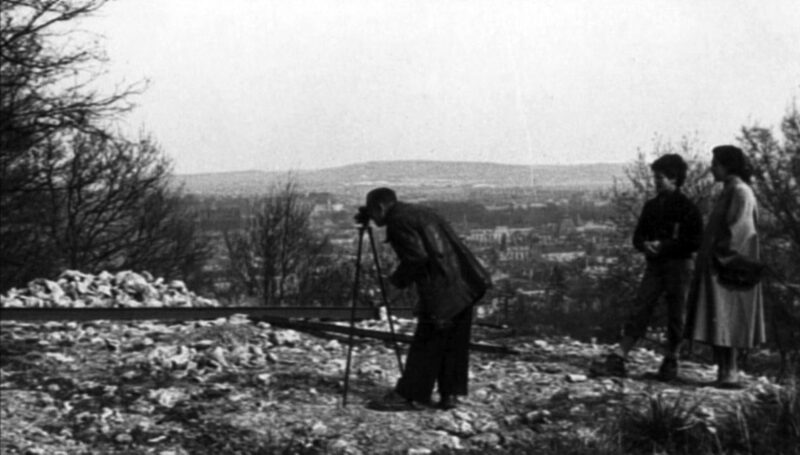 Film was seen as important, and film departments were started at universities and colleges. Film festivals were important for political reasons and not merely for the glam. Bergman and Antonioni, among many others, were hotly debated, loved and despised, revered and condemned. And then it seemed like none of that really mattered so much. 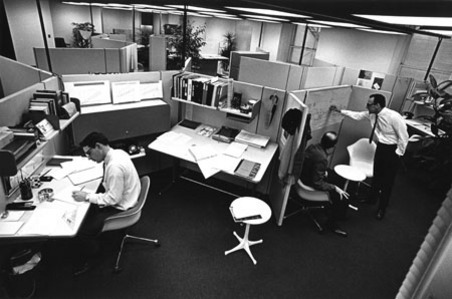 The mid-1970s arrived and the pursuit of these higher goals began to wane. The great leaders had been shot, Vietnam had “ended”, the counterculture became more and more of a drug culture, humans had already walked on the moon and that wasn’t so exciting anymore, the Beatles broke up, Nixon brought even more shame to government, and a self-absorbed “me” generation began to create a new zeitgeist of cynical pleasure. People didn’t go to the theater to find god anymore, they went to the theater to find a thrill. They didn’t go seeking truth, they went seeking a shark, or a spaceship, or the next escape from reality. I know I did. I, of course, am over-simplifying and romanticising a bit. People have always sought the thrill and the escape. Truth has always been debated. And some films still stir the soul-searching imagination and foster debate. Plus the 1970s were also an age that started many great things: personal computers, the environmental movement, the slow-food movement, to name just a few. But we are living in an age where the struggle after god and truth are essentially passé. The assumption is that there is no Truth (with a capital “T”), there are no true ethics, there is no God, there are only situations and opinions, and so, for the most part, nobody really cares anymore. The death of Bergman and Antonioni remind us of of a time when cinema was a medium for these pursuits to play themselves out, and people went to the theater to see them played out, and later, over coffee and cigarettes, or walking across campus after the student union showing of a Godard, or later still in bed with one’s lover, debated the meaning of those films and of ourselves. No need to despair, though. The big questions of our existence are still with us, and if we are brave enough we can still talk about them. And film is still of of the great mediums with which to explore who we are. 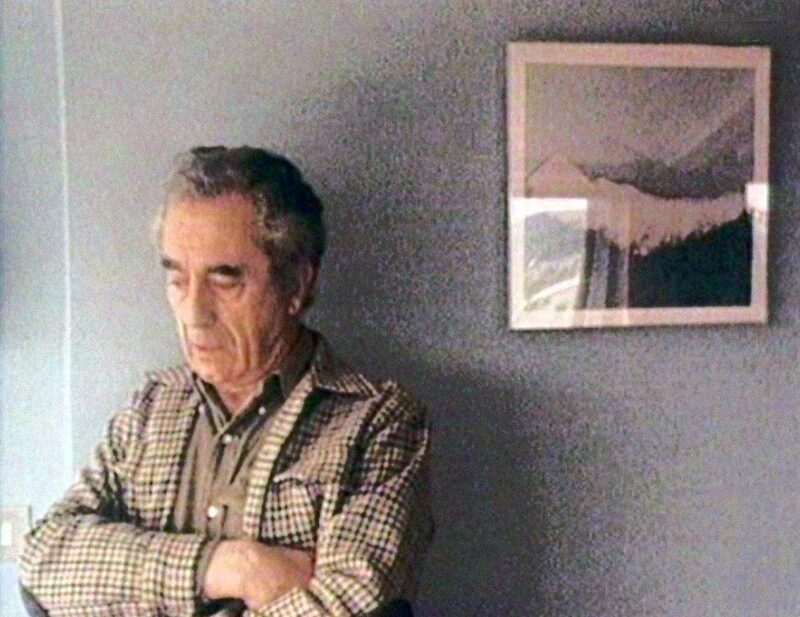 As for Antonioni, much has been said by those more intelligent than I about his genius. But what is important to separate is the ennui of his characters and his own personal hope – I say this only from watching his films, not studying the man himself. Vittoria (Monica Vitti) has left her lover. The relationship has been empty and she feels the ennui of living in the modern age. Although her feelings may not be entirely clear to herself. 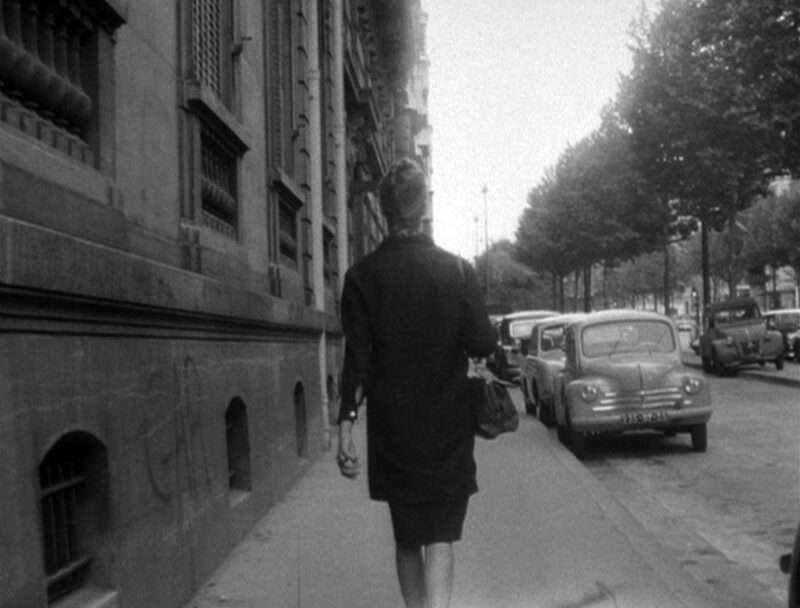 She walks back to her apartment. 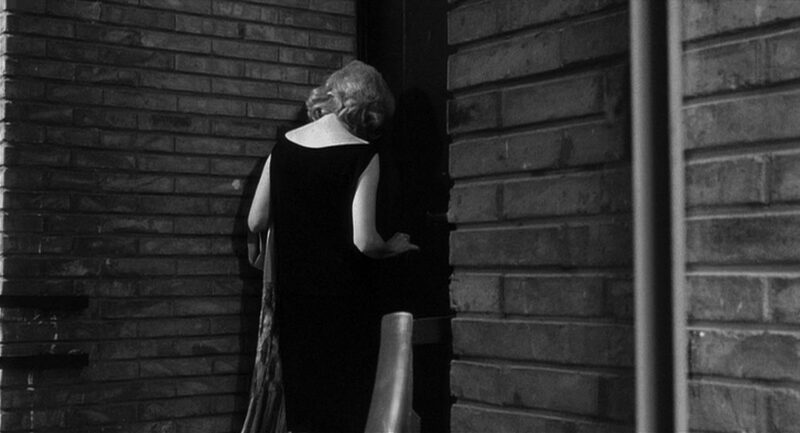 Here she watches her ex-lover walk away as she stands at the entrance of her apartment building. She is visually framed by elements of that building which seems to dominate the scene. There is a kind of hopeless emptiness in her eyes and posture. She does not yet know that it was not that she was trapped in an empty relationship from which she is now free, rather she is still trapped in herself in the modern world. 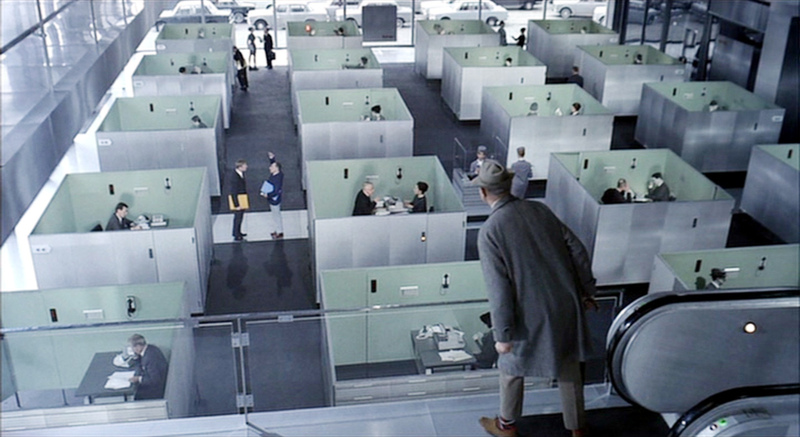 Antonioni uses modern architecture to symbolize the prison of modern society. Then Vittoria goes through the glass doors. The camera tracks left to follow her movements. 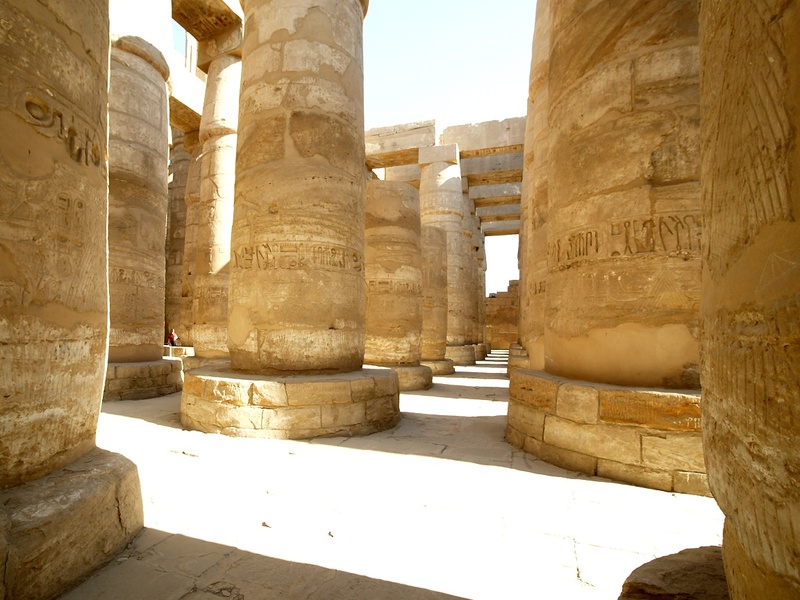 In the foreground the corner pillar of the building comes into the frame. Vittoria walks through the foyer as the camera continues to track left. But then the camera stops so that we see only a sliver of the stairwell. Vittoria walks up the stairwell and disappears around the corner. It is as though she has been swallowed by the building. Then we see her at her apartment door. Again she is visually framed by the building’s architecture. 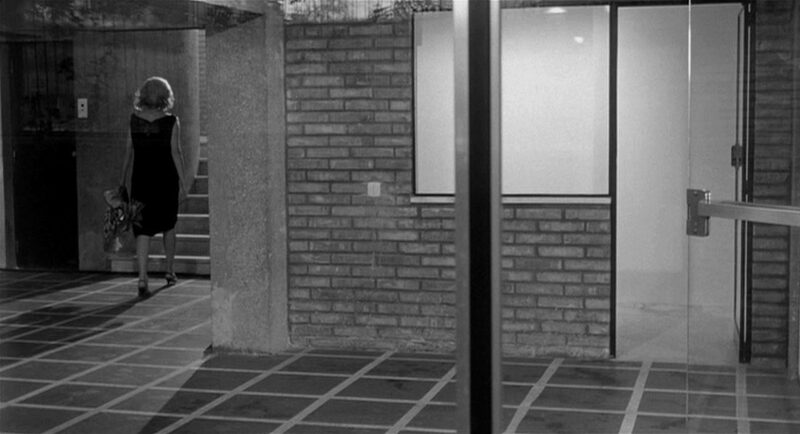 As she enters her apartment the camera is placed outside her windows in such a way as to emphasize that she is inside the building. And again, the architecture dominates, framing her “within” its space. It should be noted as well that her apartment is chic and modern. She is a beautiful, rich woman living in a beautiful, richly furnished apartment which surrounds her with the bounty of wealth. She has it good, one could say. She then walks through her apartment and goes to the window. Outside the wind is blowing the trees. The only thing we hear is the wind in the trees. Here we have the modern world set against the timeless natural world. One world is visceral the other is sterile. One world is dead the other is alive. This final shot of this sequence is critical, and one of the most important shots of the film. 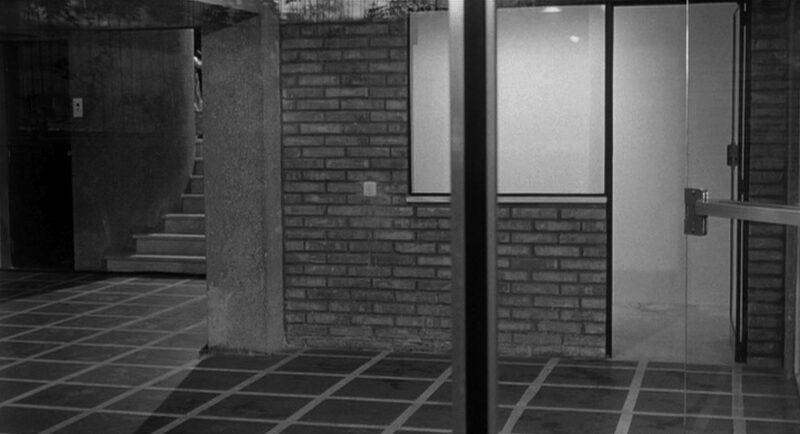 Antonioni is setting up a contrast, one that Vittoria sees but does not see. The truth is she is not lost, she is choosing her life. Every pessimist is an optimist, and so was Anotnioni. When Vittoria looks out that window at the trees, she is trapped by her own choosing, but she can still choose. The walls of her chic apartment are a barrier to the life beyond those walls, but the apartment has a door. The question is whether she has the eyes to see that she has a choice. And what is truly important anyway is that we can see, and we can choose. Ennui is a challenge to us, but it is also a door through which we discover ourselves and to understand that we must choose. 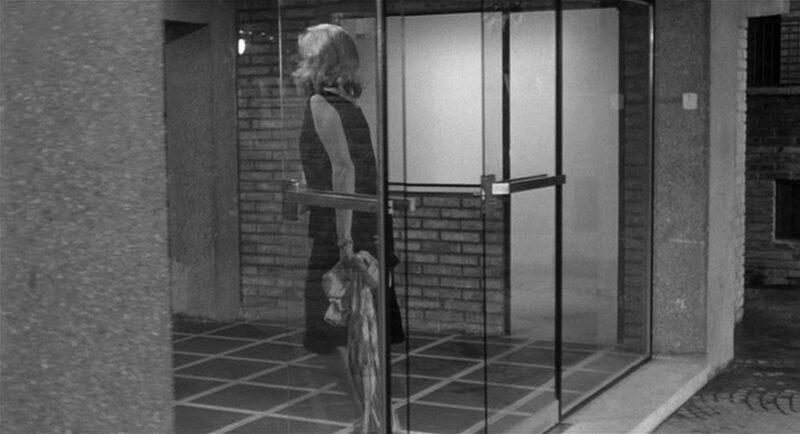 Antonioni helps us see, and his films are but one doorway to that choice. Preface: I had anticipated this to be a much longer and more involved posting for the Filmmusic blog-a-thon over at Damian’s great blog, Windmills of My Mind. But alas, life does not permit me, so I’ve decided to post more of a question than a statement. I will formulate my half-baked ideas as I go. And, of course, in typical PilgrimAkimbo style I will use the Filmmusic blog-a-thon to write about something other than film music. If you are not a true film music aficionado, as I am not, I would guess you do not select your films primarily based on who created the score. And yet, if you find a film compelling, if you become emotionally involved watching a film, if a film haunts you or stays with you, very likely the film’s music played a significant role in helping you to end up where you did. We all know this to be true. It may also be true that a film’s musical soundtrack actually helps one to merely understand the film at all. I want to propose a very simple metaphor for considering the role that film music plays in our experience of films. 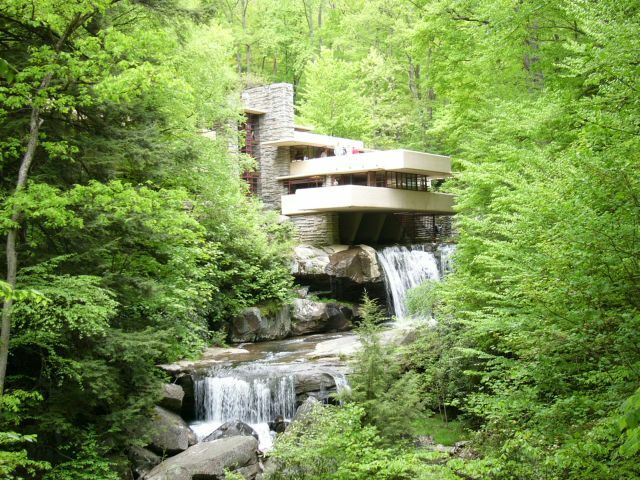 I propose that film music is like architecture. My question: does this make sense? When I say architecture, I do not mean the structural aspect of a film, such as editing, rather I am thinking of the way the design of a building or house or room affects one as one enters that room and lives out the story of one’s life. Maybe a better way of saying it is that film music is architectural. And maybe there’s a better word. 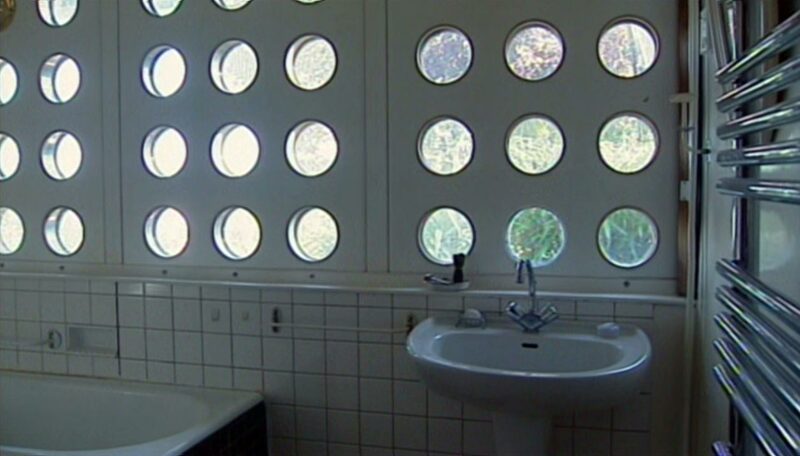 I have no idea where these interiors come from other than random images I gathered from the Internet. But it is clear that each are of clearly defined interior spaces, and that each space, though photographed from essentially the same angle, produce very different feelings. One can imagine a story taking place in each one, for example a scene of a father and son arguing over an inheritance, or a romantic kiss, or a burglary – it doesn’t matter. But more importantly, if one were to visit these places one would expect different things. In other words, the spaces themselves convey meaning about their use and their purpose. They would imply different narratives. Now, if one were to meet someone and have a conversation in each of these spaces, though the denotative content of each conversation would be the same, the connotative meanings might take on slightly different shades due to the context of the rooms. This is one of the things film music can do for a film. The symbolic meaning of architecture can be profound, as it is in the case with places of worship and important public monuments. But the language of buildings can also convey more mundane messages: where to go, what is important, how the building is to be used. It is easiest to discern this function if it absent or if it is misinterpreted. The stock scene in movie comedies in which a flustered visitor wishing to leave a strange home finds himself in the clothes closet illustrates precisely such a confusion. Like all humor, it is an exaggeration of the familiar; we have all had frustrating encounters with doors – not only identifying the right one but opening it once we found it. There is a bank entrance that I go through frequently but which always manages to confound me. The door is made of plate glass, and its pristine beauty is unsullied by visible hinges or pillars; the elegant handle extends the full width of the door. I always have a small struggle going through that door – sometimes I pull instead of push, sometimes I push against the hinge. I feel like taping a sign to the door – PUSH HERE. Could we then think of film music as being, at least in part, like the sign that says “push here”? In other words, film music is an integral part of guiding us, like architecture does in the physical world, through the mental world of film perception. In a sense, film music can tell us “how to use” a film. Architecture, that is, the aesthetic design of the spaces we live in – not merely their structural dimensions, produces an often taken-for-granted effect on our lives. In other words, the design of the buildings we inhabit affects the way we live, the way we think, our emotions, and the way we relate to others, and it does these things in often quiet and subtle ways, and sometimes in obvious and loud ways. 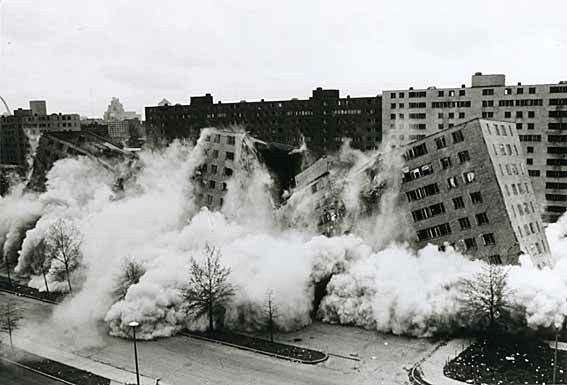 As we act out our lives in and around man made structures we act within a kind of context circumscribed, and even proscribe to some degree, by these structures. They give us a context within which to act. I argue that film music performs much the same function. Like the overwhelming feeling one gets when first entering a cathedral so are the opening chords of John Williams’ Star Wars theme. The music not merely gets one’s emotions going, but it also tells us a lot of critical information about what we are about to see and how we should think about/approach the story. If this is true, then film music is not merely an add-on to dress up a film, though it can be that for some films. Rather, film music is an integral part of how a film, as a whole, conveys its meaning(s). As one’s brain engages with the constructive nature of piecing together the film’s narrative from the various clues provided, the music colors that narrative and provides a kind of context for the descriptive, interpretive, and evaluative processes. But, because film music is typically not central to the story in the same way as is the acting or the cinematography, and because film music is typically non-diegetic (not really part of the story at all), that is why I am using the metaphor of architecture. Film music acts as a kind of “space” in which a story is played out. Change the music and you affect the story. One could say that film music, though typically non-diegetic and non-visual, is similar to the film’s mise-en-scène. Visually films cue the viewer to mentally construct the story from all the visual clues presented. Do not films also do this with music? Of course they do. But the musical soundtrack does more than merely cuing the viewer to think of a particular scene as being romantic or frightening. Music can play a role in the overall “sense” of a film, such as time period, genre, etc. And like many other things in a film, music can act like a relatively open ended set of “codes” that both support and work counter to the desires of the filmmaker. Once, when my wife took me to see a film of her choosing, one that I did not know about, I had a strong sense of what the film was going to be about from the moment of the opening chords of the film’s musical soundtrack. I leaned over to my wife and said something like: “Okay, so I can tell this film will be about X, and then X will happen, and then X and X and X, and finally it will end with X.” All that from the film’s music combined with the opening credits. And I was right. Both of these constructions are highly evocative. They draw one into their spaces and they draw out of one’s mind certain emotions and feelings. A film’s camerawork can do the same thing, but so can its music, maybe more so. Now imagine having a conversation with a friend in either of these locations. The same conversation would not be the same given the change in surroundings, even if the differences are subtle. It is this way because of our “aesthetic sense”, that is, our innate ability to respond, even sub-consciously, to aesthetic objects and nuances. To say that the couch in your living room or the pictures on your walls have a profound effect upon your life may sound strange. But they do. The things we surround ourselves with, from the films we watch to the color and texture of our bathroom tile, influence the way we think and feel. The nature of this influence may be enigmatic, but we know it is there. We know that the aesthetics of MTV, its look and feel, influence the youth of our world. We know that the aesthetics of an art gallery encourage quiet contemplation, whereas the aesthetics of a video arcade do not. And we know that living in an apartment with dark brown walls has a decidedly different feel than living in an apartment with white walls. 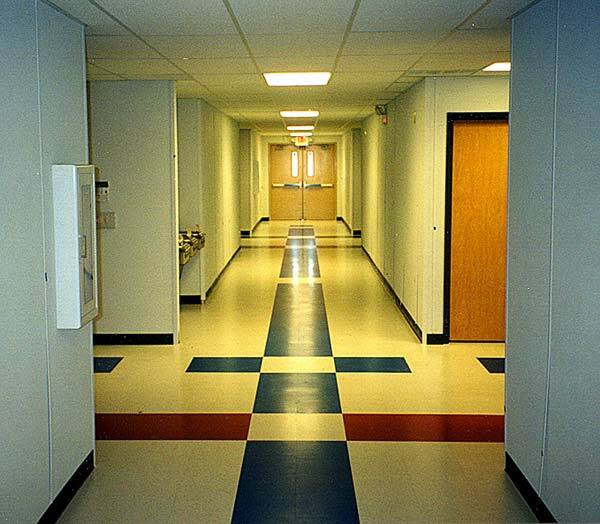 The look, texture, and sound of our surroundings influences us because of our aesthetic sense. I believe that in the mental world of film watching, the film’s musical score can be much like that art gallery or those apartment walls. If this is true, then the decisions facing the filmmaker regarding the musical score are critical. I am sure there are some who might consider non-diegetic film music to be nothing more than a kind of wallpaper – something to pretty up a film, to give it that extra something. For some films this may be true I have no doubt, but in general I think this position is wrong, for fimmakers and for viewers. On the other hand, film music is there to serve the film. For most films the story comes first and all the rest follows, often with the music being included last. I personally believe that filmmakers should not think of music as an “add on” to a film. Film music should do more than merely prop up existing scenes. Rather, film music should be a fundamentally integral part of film. Maybe directors should have the composers be a part of the scriptwriting process. I’m sure some do. And there it is as promised: some half-baked ideas on architecture for the film music blog-a-thon. I only hope it isn’t so half-baked as to be like a pancake that is burned black on the outside and still runny gooey on the inside. But maybe it’s still just a pancake nonetheless.